Colour my world, I think, of watercolors red, blue, green, and yellow. Colour my world of half-intended images that hold up more brightly in their reflections than in their reality. Colour my world with the hues you bring on this rainy day, this moment of retrospection as we all see the beauty in life, even without the sun. I find myself in the puddles of colors that mix in ripples all around your feet. I am happiest here, where I do not stand out as one red, one blue, one green yellow or black. In these shallow waters I am happy, a dewy canvas that captures the essence of each color, each life above and around me. These moments, though, do not last. When the rain princess leaves and the crowd disperses, dark clouds above shift my hues to greys and dirty whites, where I find my dwindled strength in nothing more than monochromes of memories of what once was. I do not wish to live such a monochromatic, monastic life devoid of experiences with you and the world. Rather I bathe in the hues of you, and you, and you until I am once again a canvas-burning-brightly in the light of your love. She dips gracefully to me and waves her delicate hand through the colors, ripples of green red and blue find their way to others, bringing colours and life and love to those dressed in grey. They, too comprise a world of yellows and blues, prismatic in their welcome as they surround, reflect, and create a new you and me as we ripple on to new venues, some distant and longing for a release of their monochromatic menu. It is all we can do in these days of rain: seek out the colours of the world and wrap ourselves boldly, warmly in all that we have to give one another. 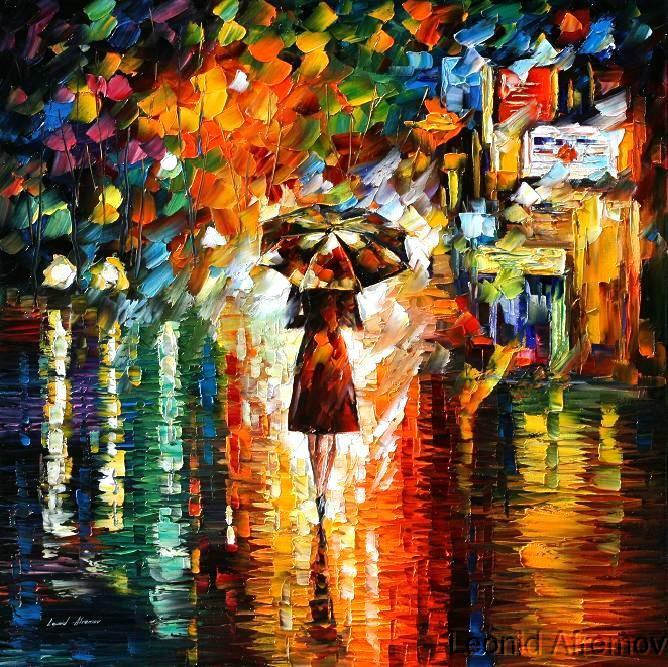 Stand in the rain and let the greens, reds, and blues flow in and around us, twirl our umbrellas while hue-filled raindrops spin like fairies, iridescent and wondrous, and shower us with prisms of love. It is not enough for us to wait in the rain for the princesses to come; we must stand, live our lives, trip the light fantastic as we dance our way along the storied canvases of our lives. To bathe and dance and sing in the hues of life, of love, is all we can ever do in lifetimes eclips’d by tragedy and sorrow. We cannot turn our black-white backs to the Rain Princess now, or ever again: with her, we marry our colours and paint these days, these wonderful, wondrous ways, with the simple strokes of lives lived with love. ❤ I really love this. Colour my world of half-intended images that hold up more brightly in their reflections than in their reality.